Do You Make Enough to Afford a Two-Bedroom Home? Affordable housing is already a hot button political issue. Housing advocates have long pointed out the lack of affordable options in big cities with booming tech sectors, like San Francisco, but where does that leave the rest of the country? We wanted to find out, so we created a new map that illustrates how much an average worker would need to earn to afford a typical two-bedroom apartment in each state. We found the data for our map through the National Low Income Housing Coalition (NLIHC), an organization focused on creating public policies that help poor Americans afford decent homes. The organization analyzed the combination of an average worker’s wage and the cost of housing to determine which states have the worst housing problems, keeping in mind that people should not spend more than 30% of their income on housing. We developed an intuitive, color-coded map highlighting how much money you need to earn to afford a two-bedroom home, revealing the places with the biggest problems in housing affordability. The first and most obvious conclusion from our map is that every single state requires more than the federal minimum wage to afford a typical two-bedroom. Even at the very bottom of the spectrum, in Puerto Rico, you would need to make $9.68 per hour. At the opposite end, someone in Hawaii would need to bring home an incredible $35.20. The vast majority of states fall somewhere in the middle of these two extremes, typically between $14 to $18 per hour. The federal minimum wage is $7.25 per hour, which means that even if you have a working spouse, DINC workers (dual income, no children) making minimum wage still cannot afford a two-bedroom in most of the country. Another interesting takeaway from the map has to do with geography. There’s a clear cluster of pink and red (more expensive) states in the Northeast, stretching as far south as Virginia. 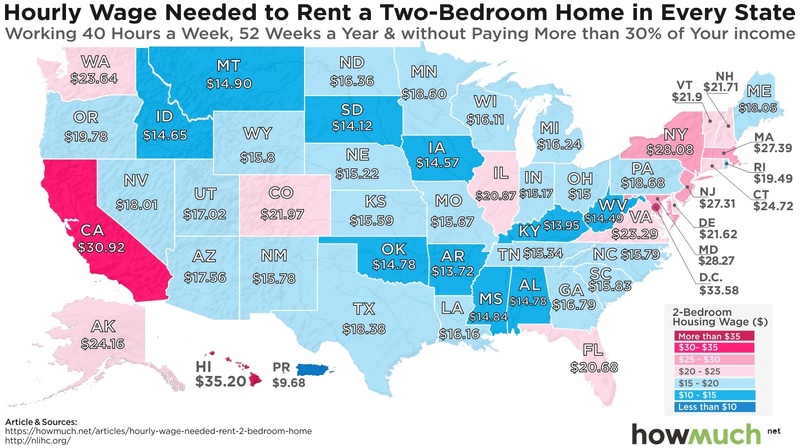 This indicates that workers need to make around 3 times the federal minimum wage to cover their rent. Bear in mind that not every low-wage worker makes the federal minimum; in fact, many states and cities set their own, higher, wage floors. In New York City, for example, the minimum wage is progressively rising every year until it tops out at $15 by 2021. Even by this measure, employees working in these low-paying jobs will still fall hopelessly short of earning a sustainable, livable wage—you need to make $28.08/hr today to afford a two-bedroom in the state of New York (it should go without saying that the state average is certainly much lower than that of housing in the City), let alone what you will need to earn three years from now. The current debate surrounding affordable housing clearly focuses too much on big cities with housing shortages. These places are experiencing rapid growth from booming technology sectors, and they don’t represent the broad experiences most Americans face every day. Politicians would be wise to pay a lot more attention to how the working poor struggle to make ends meet everywhere in the country.